Principal Renee Castillo noted that in August 2016 she had invited in the Vermont School Board Insurance Trust to inspect the existing structure and was concerned when they found that the wood foundation had rotted. Because of this, the structure was closed and was “off limits” to students, therefore, limiting the opportunities for play for the whole 2016-2017 school year. A committee was formed to address the issue and began the process of planning a new structure. There was consideration of rebuilding or recycling parts of the current structure but current regulations for safety, accessibility and the age of the structure, prompted officials to determine that they could not adapt the existing playground into a new play structure. The committee organized a fundraising campaign, which included a letter to all of the residents in the two towns served by Barstow (Chittenden and Mendon), outreach to local businesses, exploring grant opportunities, and accessing the Joe Caler Memorial Fund. “The response received was amazing,” said Castillo. “We are happy to report that we have raised enough money to purchase our new play structure. This would not have been possible without all of the work of the playground committee and the generous donations of our community members and local businesses. Through our letter campaign alone we raised $14,025. The new playground will be installed over the summer and should be ready for play by the end of August. 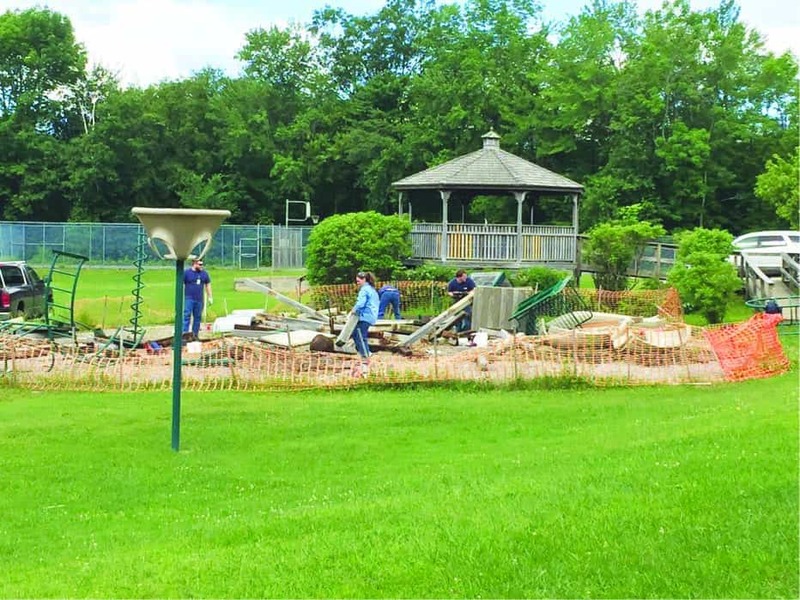 A crew of volunteers from General Electric dismantle the old play structure at Barstow Memorial School in anticipation of the new structure that is expected to be delivered early August.